18 February 2015, at 9:39a.m. THE NETHERLANDS - For nearly 30 years, Vencomatic Group has been automating the collection of turkey hatching eggs. The latest version of its Turkey Nest provides increased robustness and animal-friendliness and it is easier to manage whilst still retaining the advantages of its predecessor. 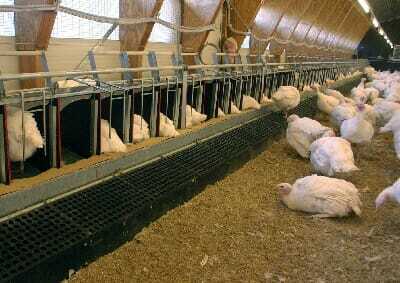 Vencomatic's Turkey Nest is designed to maintain the perfect egg quality after lay. Its unique features like the gravity trap, the tipping floor and the egg belt protect eggs on their journey resulting in more settable hatching eggs. The gravity trap mechanism allows only one bird in the nest at a time. This results in less egg damage and helps to prevent broodiness. When the nest is empty there are no obstructions in front of the nest, which ensures easy accessibility. The tipping floor is a reliable closing system that gently expels birds from the nest. This prevents broodiness and soiling of the nest. Automatic expulsion also replaces manual removal of birds from nests. The new wing protectors on the sidewalls of the nest prevent injury to the birds. Eggs that have just been produced, land on the Vencomat and roll directly onto the eggbelt to prevent any possible damage by the birds. The eggbelt has square holes ensuring minimum contact with the egg and a smooth transfer through the house. It is made of antistatic material for optimal hygiene. Furthermore, the nest is equipped with a new Clock Manager. This touch-screen computer provides farm managers with clear overview and optimal control to manage the expulsion.